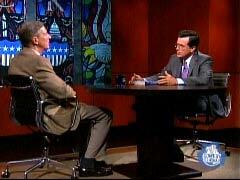 Wednesday night on "The Colbert Report," author Charles Kaiser was on the show to plug his book, The Gay Metropolis. Hoping to get the Colbert bump, Kaiser talked about how his book chronicles the history of gay culture and society in New York starting from 1940. One of his claims is that homosexuals and African Americans are “both more interesting than straight white people.” He also discussed being open with who you are or else you become like Mark Foley: “You become a congressmen who sends nasty notes to teenagers over the computer.” He lastly implies but denies that J.Edgar Hoover is gay. Colbert: "You say that gay people thrive in places like New York." Colbert: "Why? Why do they thrive here in New York? What gives them power here?" Kaiser: "Well, critical mass first of all." Colbert: "They're like a nuclear bomb. They're very, very... they're very dangerous is what you're saying. We agree on that." Kaiser: "Without gay people and black people we have nothing but straight white males." Colbert: "Don't equate black people and straight people. Don't just say the black people are on board with the gay thing. I know you're both oppressed minorities." Kaiser: "They're both more interesting than straight white people. That's all." Colbert: "Now, nothing against gay people. But why do they have to be open about their gayness? For years... I'm serious here. For years they were, you know, they weren't any gay but we didn't have to hear about it." Kaiser: "We discovered if you're not open about who you are, there are two possibilities. You become a Republican congressman who then sends nasty notes to teenagers over the computer or you lead a large congregation in Colorado of Christians." Colbert: "Now you're stereotyping Republican congressmen." Colbert: "And members of mega churches. It’s okay for you to be a bigot." Lastly, Colbert and Kaiser discussed former FBI director J. Edgar Hoover. Kaiser claims never to make the assertion Hoover was gay, but Colbert pointed out that Kaiser did in fact write about him in a book named The Gay Metropolis. Kaiser then seems to think nothing of it because Hoover is dead, so there are no legal ramifications for making false claims about a dead person. Colbert: "You said that J. Edgar Hoover was gay." Kaiser: "I didn't say that. He did not have a sexual relationship with his aide. They went to work together everyday in the same car. They came home together. They lived around the block together. Did they do it? I have no idea. I don’t assert that they did." Colbert: "Okay. But you put him in a book called The Gay Metropolis." Kaiser: "That's true. You can't libel a dead person, Stephen." Kaiser: "You can't libel a dead person." Kaiser: "They can’t sue you. It's the law." Colbert: "I'm big on slandering dead people."